Chocolate Beats Up Our Teeth! 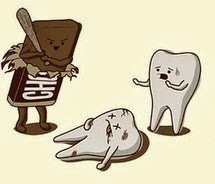 Chocolate loves to beat up teeth! Thankfully, it’s not as harmful as other sticky, gummy candies, but it sure is mean!